I traveled by plane for the first time in my life 3 months ago. It was 4 trips, which meant 4 hand luggage inspections. I have a huge problem: I was asked to remove my laptop and tablet from my bag and place them alone on a separate plastic tray. While they pass through the X-ray machine, I pass through the metal detector. However, when I go back and grab my laptop, I get the living s**t zapped out of me. I did it twice (in 2 different airports with very different security devices) and it happened every time. My brother did it once and it did not happen to him. Likewise for my mother. The sound is so loud, people turn to look at me. And it's so painful to me, I involuntarily jump backwards. The spark is clearly visible but there is no burn mark or anything like that on my hand or my laptop's paint. My laptop has a stretched aluminum case painted in black (more specifically, Lenovo IdeaPad y510p). Touching the tablet after the laptop has no effect. I never touched it before the laptop because experimenting was the last thing on my mind at the time. My best idea is to wear gloves when handling my laptop, but I fear two things: 1. I'll look suspicious and only end up wasting everyone's time going through checks and what-not. 2. If I don't discharge the laptop, it will discharge on something else, possibly doing damage, or worse, zap me later at a perhaps more inappropriate time. I touched more metallic objects before my laptop, such as the edge of the thread that moves the bags and my belt. Anyway, a good trick is to touch the laptop with a piece of metal, such as a key or coin or paperclip. You hold one end of the key firmly and touch the laptop with the other end, so the spark is away from your finger and doesn't hurt. (You might still feel a little tingle between your fingers and the key.) Unfortunately, since you have to go throug a metal detector, it might not be so easy to have a piece of metal with you, but something like a paperclip might be small enough not to trigger it. While certainly not as good as Nate Eldrege's answer, I have a fairly simple solution for dealing with shocks. 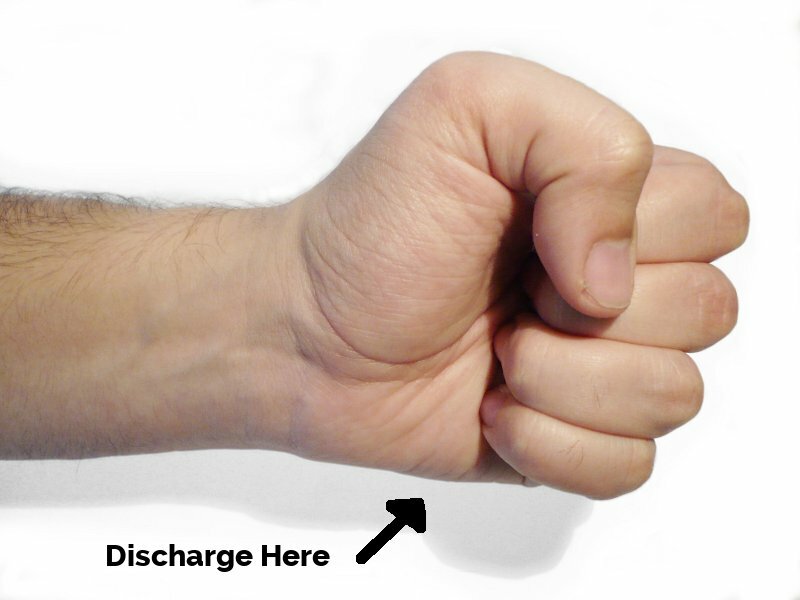 Whenever I determine that something is a source of electrostatic discharge, I always put my hand into a fist and discharge with the bottom of my fist (ie: the opposite side that your thumb is on). Tuck your thumb into your closed fist under your fingers. This area certainly isn't as sensitive as your extended finger and will significantly lessen the pain/discomfort of discharge. Again tucking your thumb in and making a tight fist, as I have found, lessens the severity of the shock. Test it out on low-shock items (ie: metal doors, etc.) to get a feel for it. I've had this issue at some security checkpoints and not others. When you are picking up your stuff, get the resistor out of where you keep it in your laptop bag. Hold one of the resistor's leads in your fingers and touch the other lead to the laptop's metal case. Done. As others have noted, using a coin or paper clip will also save you from pain. The pain from a discharge of static like this is actually not from the electric current affecting your nerves directly, but from heating at the point where the arc hits your skin. By making the arc hit metal removed from your skin, you avoid this. The reason I suggest the resistor is that even if you don't feel it, sudden static discharge is bad, bad, bad for microelectronics. Laptops are pretty well protected (any assembled product is these days... or should be), but a bit of extra caution can't hurt. By discharging through a 1 meg resistor you bleed the charge off slowly. Discharging through a coin, which adds maybe half an ohm of resistance, won't make the discharge appreciably slower. A 1 megohm resistor of 1/2 or 1/4 watt power rating or so will cost very little, depending on where you buy it and how many you buy at once. You can get a hundred of them on eBay for under 10 bucks. You can get them from any of the electronics distributors on the web (Mouser, Digikey, Newark, Allied, etc.) for 20 cents or less in quantity 1, but the shipping charge may be absurd. If you have a retail store nearby that sells electronics parts that's likely your best bet, even though they'll charge more for the part, you won't pay shipping. Radio Shack catalog number 2711356 will do (but you'll have to buy five of them, for $1.50 for the pack). The power rating on the resistor won't matter - a 1/4 watt or 1/8 watt rating is fine, as is the typical 5% or 10% tolerance rating. Heck, speaking of tolerance, even the resistance value isn't terribly critical - anything from about 500K to 5 Megohm is good. You want an "axial lead" part, no other type. Or, if you know an electronics geek, ask them - they likely have several (or many) and will just give you one. Chances are - your socks are charging on the carpet (as you may be required to take off your shoes) and this causes the static build-up (and then discharge). Try putting your shoes on first, and touch a metal object (like a desk) before you touch your laptop. You can also try spraying on anti-static guard on your clothing - do not spray it on your laptop. Not the answer you're looking for? Browse other questions tagged airport-security electronic-items x-ray-machines or ask your own question. How do I prevent damage to electronic devices at airport security? Can you just charge your phone/ipad/laptop at the airport at any outlet? My sister's laptop was gone when she gate-checked her bag. What can she do? How can I preclude border agents from seeing emails on my laptop? Will my HDD's get checked when leaving the country at UK airport? What is the purpose of putting all your gadgets in the trays the TSA provides?